The weather has gotten beautiful around here. We’ve had all our windows open for the last week and our temperatures haven’t gotten above 75. Fall is on it’s way and I can’t wait! 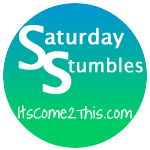 Check out Mandi at It’s Come 2 This for more Saturday Stumbles. 5 Responses to "Saturday Stumbles – Football, Fall and Family"
Good for you. I bet they are delicious! Those rice crispy footballs looks super yummy! I agree, the rice crispy footballs look fantastic! Chris saw me checking out the recipe and said, “we need to have a football party and make those” haha. Hope the BBQ was fun!